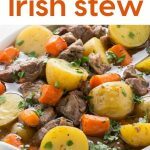 My Instant Pot Irish Stew recipe is an authentic version that I grew up making and now I’m passing it on to you, I hope you’ll enjoy it as much as we do! Traditional Irish Stew is a meat and vegetable hot pot type of dish that typically contains lamb and potatoes. As with all regional cuisine there is no official recipe, but all the Irish Stew recipes I’ve ever tried back home in the UK were made with lamb or mutton, not beef. 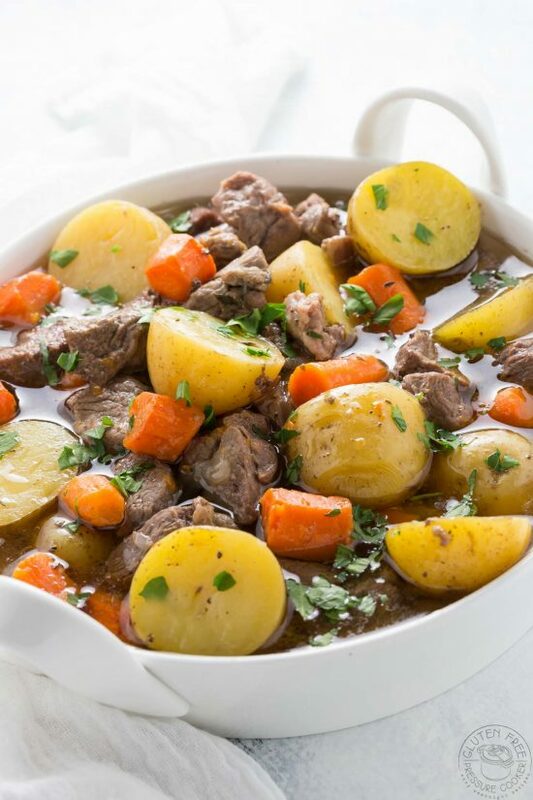 There are other ‘Irish Stew’ recipes out there that are made with beef and beer, usually Guinness and they are very nice but quite different to this version. My pressure cooker recipe is older and predates the one with the beer, and of course it’s gluten free and whole30, so no beer in sight! This is easy to make and has so much flavor from the lamb and fresh ingredients. I like to saute the lamb pieces in my Instant pot first, I usually cut the chops into large chunks instead of leaving them whole. Then I add the water to deglaze the pan, throw in the thyme, and layer the lamb, onions, potatoes and carrots. I’ve kept the potatoes in large pieces (I just halved baby potatoes and kept the peel on) so that they don’t turn to mush in the pressure cooker, and the same for the carrots. I don’t use stock or broth, just water. When the lamb cooks it makes it’s own stock which has a wonderful flavor so don’t be tempted to add any store bought stock. 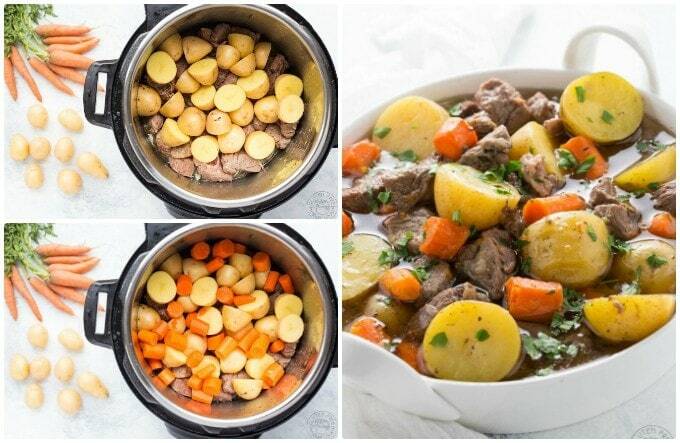 Pressure cooker Irish stew is an adaptation of a classic recipe with lamb, onions, potatoes, carrots and herbs. It's gluten free, paleo and whole30, perfect for your Instant Pot. 2 tbsp arrowroot or cornstarch , to thicken, if desired. Cut the lamb chops into cubes, or in half, whatever your preference is. If the bone is in the way skip this step and leave them whole. If you cut out the bones, don't throw them away but add them into the water in the pot, it will enhance the lamb stock. Turn on the saute function on your Instant Pot or other electric pressure cooker and adjust to the medium heat option. Don't wait for the display to say 'hot', add oil right away. Now add the lamb chop pieces and saute a little to brown on each side. Do it in batches and when they are done remove them to a plate. Cut the carrots into big chunks or you may find they are too soft if you make them very small, do the same with the potatoes. If you use baby potatoes as suggested you can half them, or leave them whole if they are very small. Add the water to the inner pot and deglaze the bottom of the pot, and then turn off the saute function. Add the thyme. layer the meat, then sliced onions, carrots, and potatoes, and add a little salt and pepper with each layer. Lock the lid, turn the steam release vent to 'sealing' and using the manual setting, adjust it to cook for 11 minutes at High Pressure. When the cook time time is up, allow the unit to reduce pressure on its own without opening the steam release vent (Natural Pressure Release) for at least 12 minutes, then you can gently release the rest of the pressure by opening the vent. If you want to thicken the stock then mix 1tbsp cornstarch, or arrowroot or tapioca starch for paleo, with a little water and add to the hot stock in the pot. If you need to thicken it up more then use the saute function to heat the stock up again. serve hot, sprinkle with chopped fresh parsley. I’ve never cooked with lamb before, is it easy to find? Hi Ella, I found lamb shoulder steaks in my local Kroger, they usually have a small selection. Hi! Is there a way to adapt this to a slow-cooker? Perhaps same method, just let it simmer all day? I would follow he same method and try it on high for 4hrs or 8hrs on low, I *think* that would probably work ok but I’ve not tried it, I’ve only made it this way, or on the stovetop. Can I convert this to a crockpot? If so how? Can this be done with beef if lamb is not an option? Would you add anything to enhance the flavor? I’m new to the IP. Thanks! Hi Jennie, I think you’d be better off trying my Beef and Butternut Squash Stew (the recipe is on the site here) than swapping out the lamb for beef in this recipe. 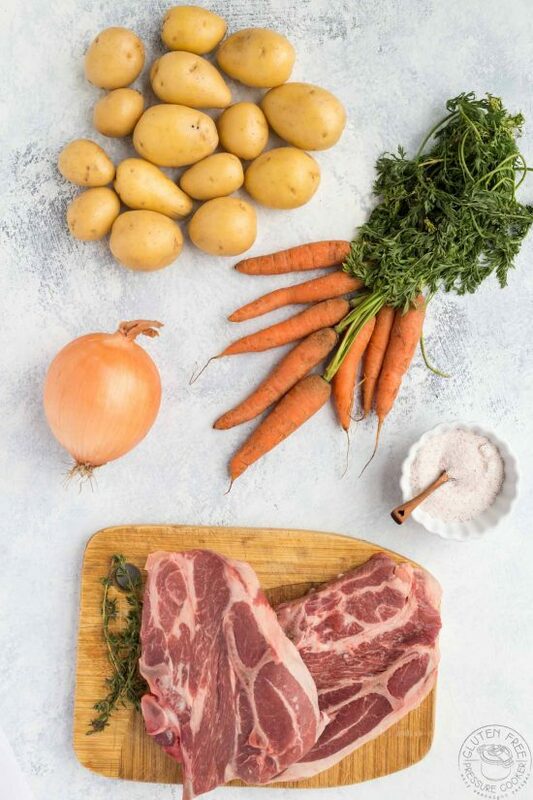 The flavor in this recipe really comes from the lamb itself while and it would in theory work with beef I just don’t think it would be as nice, I hope that helps! I’m not finding when to sauté the onions in the recipe (I could be absolutely blind). And is it really 4 large onions? Your photo shows one and 4 seems a lot so I want to make sure. Thanks! It’s my poor editing skills, not your eyesight! So there should only be one large onion, I’ve corrected that. I didn’t saute the onions, you just add them in with the carrots and potatoes layer. The onions will cook down a lot in the pressure cooker but they will add a lot of flavor to the stock.